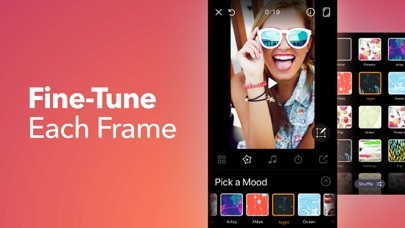 IOS App Developer: Free photo video editor and picture movie editing PTE. LTD. It keeps on telling me I have to pay to use it which is bonkers, 1 star. I got the app to make a simple slide show and i didnt even end up making it, i put my card in for the one week free trial thing and i tried to cancel it but i couldnt, until legit just now, but ive been getting charged for this app without my knowledge until i decided to look at my transaction history and i saw all these little charges. I want a refund of everything. This is definitely not cool. Hi I use this app only once last summer on aug since then they keep charging me and I have no idea how to get it cancel wish is totally unfair. Don’t bother. You can ever cancel the 20 a month they charge. Total scam. It’s not free! It has a 7 days trial. Making the slideshow is easy, but putting music is lame. I have music downloaded to my phone, and the won’t let me add the song to the slideshow. I couldn’t find where to cancel the subscription so I thought if I deleted the app it would cancel it! Nope I was wrong over $50 in charges made to my account. I used this app a while back to make a slideshow for my daughter. I used the free trial and it worked great. I understood about the subscription fee so I unsubscribed so I wouldn’t be charged. Then I wanted to make a slideshow for my son so I resubscribed and paid the $2.99 to get a week. I spend hours picking out which photos to use but it just kept freezing up and never allowed me to proceed with making the video. I tried over and over again and it would just show it was downloading but it would never finish downloading. I tried restarting the app. It did save which pictures I had picked but it never let me proceed. I would like a refund because I wasn’t able to use any of the features and had to cancel it again. So frustrating and disappointing. 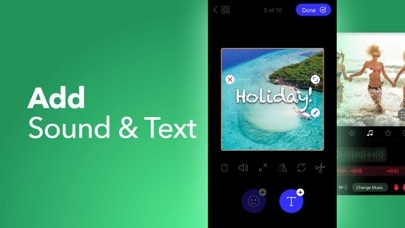 More IOS Apps by Free photo video editor and picture movie editing PTE. LTD.